You gotta give the marketing team at Burger King this: It is persistent. The restaurant, after being snubbed by McDonald's, is reaching out to four more burger chains seeking partners to create the ultimate frankenburger combo in the name of Peace Day. Burger King has announced, via open letter on Facebook and Tumblr, that it's following through with plans to build a pop-up restaurant for the exclusive purpose of splicing its Whopper with a competitor's burger. Since McDonald's (MCD) CEO Steve Easterbrook already said he's not going to do it, Burger King is now reaching out to Denny's and the lesser-known chains Wayback Burgers, Krystal and Giraffas. According to Burger King, all four have said they are willing to collaborate. "Our idea would be that we all come together to create a burger that combines a key ingredient from each of your signature sandwiches," said Burger King. 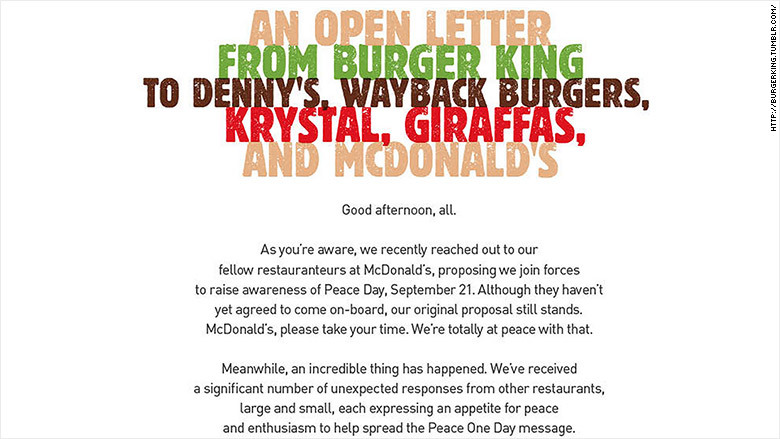 "Let's keep the conversation alive and create a burger merger to remember on Peace Day, September 21." Burger King has expanded its McWhopper offer beyond McDonald's to four other restaurant rivals, including Denny's. 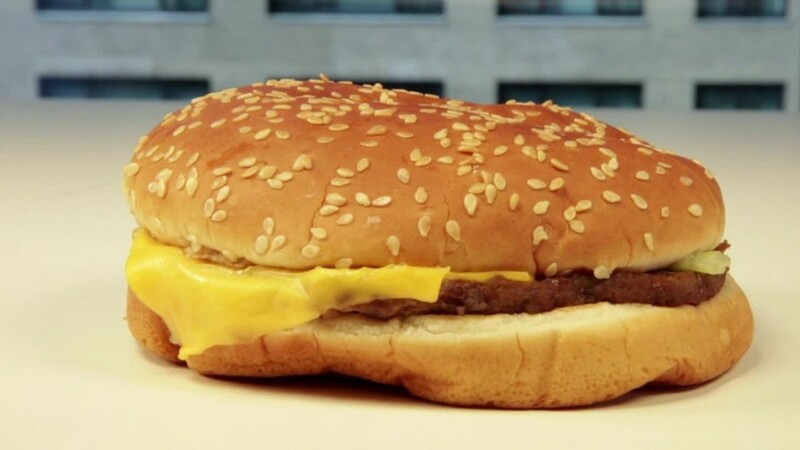 Denny's announced on August 31 that it would participate with Burger King's offer, even though it wasn't invited, by combining its signature Slamburger with the Whopper. This breakfast diner-style hybrid would stack two beef patties with pickles, onion, lettuce, tomato, hash browns, fried egg and bacon. Giraffas Brazilian Grill has 10 restaurants, all in Florida. It has burgers and Brazilian-style steaks. The company tweeted, in Portuguese, that the hybrid sandwich could be called the GiraWhopper or the BKBrutus. Wayback, headquartered in Connecticut, has nine different burgers on its menu, including the Wayback Classic. Though its most impressive offering is undoubtedly the Triple Triple, which has nine patties, nine slices of cheese, 1,780 calories and 108 grams of fat. Krystal, an 83-year-old company from Atlanta, has compact-looking burgers that bear a strong resemblance to the little burgers from White Castle, which is an even older company, from 1921. Burger King said its pop-up restaurant would be located in Atlanta, the approximate halfway point between Burger King headquarters in Miami and McDonald's headquarters in Chicago.